15Five is a great tool for a weekly pulse check of the organization: goals, accomplishments, roadblocks, and ideas. One of the scenarios it is not very suitable for is for structured performance reviews. Also, the tool is naturally not useful for people whose job responsibilities are not dynamic or do not change from day-to-day. 1. Does your company have the appropriate bandwidth to stream the videos?2. How should your company brand the platform to align with your talent brand and overall company culture?3. How do I create the process to yield a high completion rate?4. How do I engage with the candidate via the on-demand feature to encourage them to use the built in resources to best prepare for the on-demand interview? Weekly goals and accomplishments: This is the core of what we use 15Five for. Any employee with varied daily job responsibilities fills out a 15Five report that mentions their accomplishments for the week that went by and their goals for the upcoming week. Wash, rinse and repeat. Customizability: 15Five provides a lot of options to customize the questions that employees need to answer on their weekly reports. Tagging: You can tag your colleagues in your report, so it's a great way to get somebody's attention within the company. Visibility: Individual 15Five reports are visible to everybody up the chain, so it's a great tool for business leaders to get a pulse of the organization. The Hirevue software is fairly intuitive and easy to use. The technical support is always available; the staff are very knowledgeable about the product. The Hirevue features are flexible to meet the individual needs of each hiring manager and position. The interface to set up the question frequency is a bit confusing. The 360-degree review functionality is relatively new so there are still some kinks to work out on this part of the product. It would be nice if there was a place to make notes on a particular candidate. 15Five is the first performance management system I have utilized. It has also allowed us to streamline our review process, making everybody's life easier! We are able to evaluate more candidates in a smaller amount of time. It did allow us to realize we need more internal interview training. It is easier for the managers and candidates think it is very innovative for a tech company. 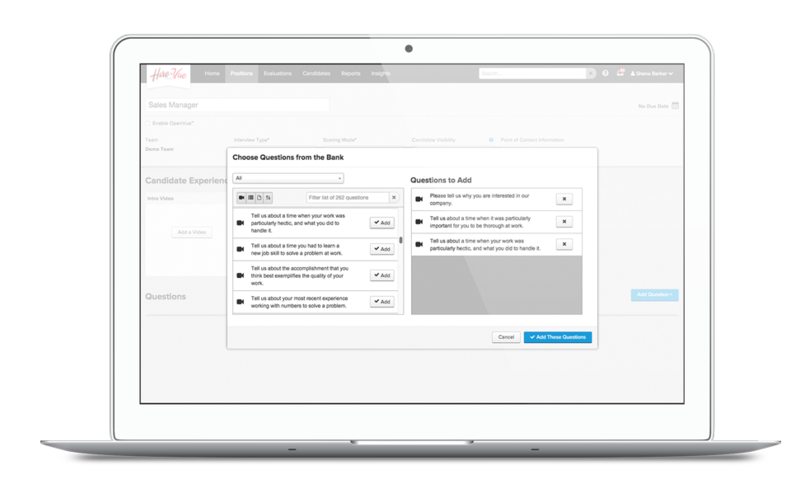 Manager can create a digital interview with questions and challenges to evaluate job candidates or they can ask their team to respond to real-life situations by creating a practice session.